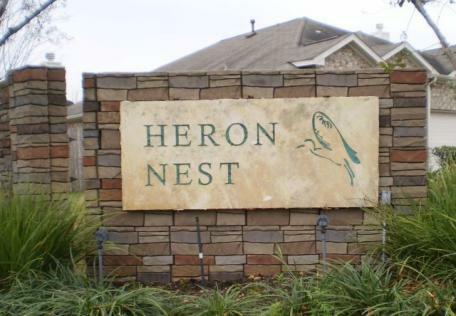 Heron Nest Owners Association is a small community of 315 fairly new homes located off Gesner and Beltway 8. Build out of the homes was completed in June of 2007 and the Board was formed in September 2007. C.I.A. Services began management for the community in November 2007. This hard working board of four dedicated volunteers works diligently to make improvements to their community. They are teaming up with Mathew Bonasera to close off two streets in the community in an effort to control traffic speed and crime in the community. The board has plans to install a playground in 2009. The Board of Directors, along with C.I.A. Services, has worked hard to begin an active enforcement of the deed restrictions and maintain a 95% maintenance fee collection rate. Many thanks to the Board of Directors for your tireless efforts to make Heron Nest a thriving community whose property values are among the highest in their area. Thanks also go to the many residents and committee volunteers who have supported the Directors in their efforts. A big “Congrats” go to all the residents of Heron Nest for your continued cooperation and support in maintaining the integrity of the community and the Harris County area.